MMRP Director Lars Bejder was using a drone to shoot video of other humpback whales off the coast of Maui (under a permit from the National Oceanic and Atmospheric Administration) when he got a call from one of the local tour operators. “They had just seen all this whitewater and commotion in the water and weren’t quite sure what it was and suddenly there was all this blood in the water, which made us go over there and that’s what we discovered–a newborn calf,” Bejder recalled. 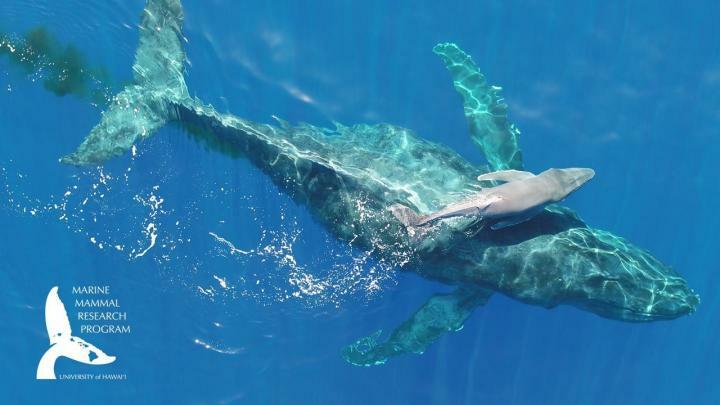 Bejder says key collaborators helped him to be in the right place at the right time to record the video, including Ultimate Whale Watch, Oceanwide Science Institute and the Applied Research Laboratory of the University of Hawai?i.